You've gotta love the Warblers, don't you? Blaine takes center stage in this photo. 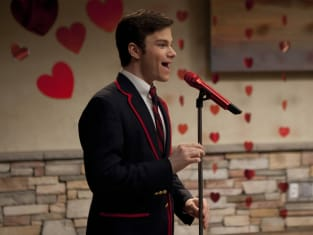 Glee Season 2 Episode 12: "Silly Love Songs"
Glee Spoilers: Hope for Blaine and Kurt? I'll just marry an NFL player. They're super reliable. Permalink: I'll just marry an NFL player. They're super reliable. I had a cat thrown at me in a nursing home once. Permalink: I had a cat thrown at me in a nursing home once.